Erich Schoennagel, P.E., is Manager of Transmission Engineering at CenterPoint Energy, responsible for overhead and underground installations at 69kV and higher. 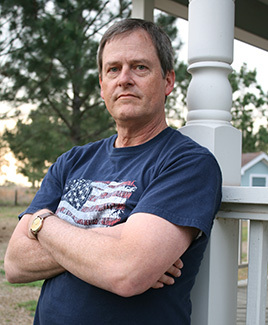 Erich is Class of ’80 from Texas A&M, where he received a degree in Civil Engineering. He is a long time resident of the Houston area, first settling in Kingwood, and now resides in the Cypress area. In addition to playing music with CRB, Erich joins Brock Miller, Steve Thomson, and Darrell Wehlmann on Sunday mornings at St. John Lutheran Church in Cypress, Texas, to provide the bass line at the 11am Praise Service. Erich is married to Jeannie for 25 years, and they have two college aged children. It was Erich’s daughter and son who recognized his passion for the bass, and pooled their money together to buy him his first bass guitar ten years ago; a shiny black Fender acoustic/electric bass, which he still plays at functions. On stage Erich plays a USA-made Fender Jazz four string bass with a shiny black pick guard to remind him of the generous gift his kids gave him. Erich will tell you that he enjoys all types of music, but if you would have looked at his album shelf during his high school days, you would find well worn Three Dog Night, Led Zeppelin, Little Feat, Aerosmith, Bad Company, and Joe Cocker LP’s.